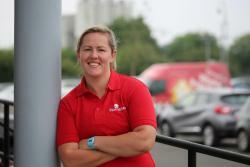 HomeServe plumber and international rugby star Marlie Packer has swapped her tools for her boots after she completed her final day on the job ahead of the women’s Rugby World Cup. Flanker Marlie, 27, dropped in to see colleagues at HomeServe’s Walsall HQ on Friday before clocking off for the final time ahead of the tournament, which gets underway this week. Marlie, who was part of England’s World Cup winning side three years ago, has now joined up with the rest of the squad ahead of their first game. And if she plays in all three pool games, she will reach the magical mark of 50 caps for her country. Marlie said: “Everyone at HomeServe has been so supportive of my rugby ever since I joined and it’s been so reassuring to have that behind me. “I’ve been working really hard towards this tournament for a long time now and I’m just excited to get going. “But I couldn’t leave without popping in to see everyone and say a massive thank you to everyone who has given me so much support. Marlie has combined her career as an international rugby player with her work at HomeServe since she joined the firm in 2013. She now helps cover the West Country, which fits perfectly with her club rugby, where she plays for table-topping Bristol Ladies. 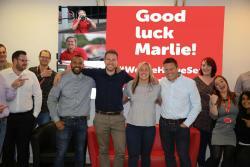 HomeServe Brand Director John Greaves added: “We’re so proud of Marlie and of everything she has achieved both in her rugby and in her career at HomeServe.